GEORGE H. ROSS is co-star of the hit TV show The Apprentice and Executive Vice President and Senior Counsel for the Trump Organization. Previously, he was a real estate attorney, private investor, and senior partner at a major law firm. He has served as business advisor, legal counsel, and negotiator for the leading real estate owners and developers in New York City for fifty years. On the side, he cofounded a radio station business that he sold for millions of dollars. Ross also teaches negotiation at NYU's School of Professional Studies and Continuing Education. ANDREW JAMES McLEAN is the co-author of seven books, including the bestseller Investing in Real Estate, Fourth Edition, also from Wiley. Chapter 4. High-Powered Real Estate Negotiation Techniques and Tactics. Chapter 5. 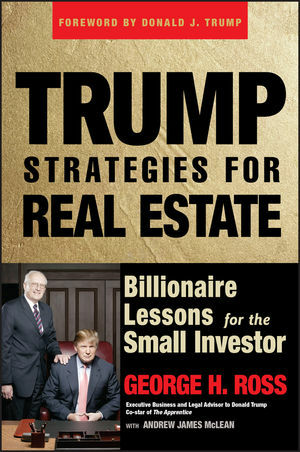 The Trump Touch: Create "Sizzle," Glamour, and Prestige to Get Higher-Than-Market Prices for your Properties.